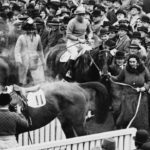 Sports Then and Now | The Preakness Stakes: Can Uncle Mo Write His Name in the History Books? The Preakness Stakes: Can Uncle Mo Write His Name in the History Books? The Grade One Preakness Stakes is known also as the “The Run for the Black Eyed Susans” due to the blanket of the Maryland State flower being traditionally draped over the winner’s neck at the end of the race. 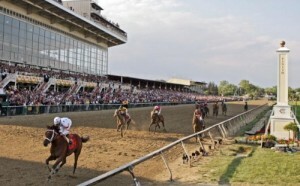 The race is run annually over 9½ furlongs on a dirt track at the world famous Pimlico Racecourse in Baltimore, Maryland and is recognized as the second leg of the highly coveted American Triple Crown, which comprises of the Kentucky Derby (first leg) and Belmont Stakes (third leg). The attendances at the race are the second highest in the sport, with only the Kentucky Derby at Churchill Downs attracting more spectators, in 2010, 95,760 people attended but that was down from over 121,000 in 2007 following the banning of fans being able to bring their own beer. The race is open to colts and fillies, with the ‘boys’ having to carry 126lb and the girls 5lbs less. The history of the race dates back to 1873 (2 years before the Kentucky Derby) when Pimlico introduced a new quality Stakes race for three year olds. It was called Preakness in honour of a colt of the same name, who was the winner of the feature race on the day that Pimlico first opened in 1870. The first ever race was won by My Sheba who won by 10 lengths in fantastic style which remained the most emphatic victory in the race until 2004 when Smarty Jones, who had won the Kentucky Derby two weeks previously, came home by 11 lengths. Smarty Jones was then aimed at the Belmont Stakes where he became an odds on favorite in the Belmont Stakes betting to win the race and thus the coveted Triple Crown, which had not been won since Affirmed achieved the feat in 1977. In heart breaking fashion however this hugely popular colt, whose presence at Belmont Park had attracted it’s biggest ever crowd, was to be denied in the ‘Belmont’ by the late run of 36/1 outsider Birdstone. This year will see the winner of the Preakness Stakes given the opportunity to earn a huge 5.5 million dollar bonus courtesy of MI Developments. 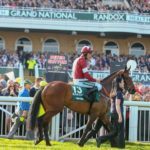 The plan is designed to attract greater use of those racecourses owned by MI Developments, who have put up the money receive in return the opportunity to run Preakness Stakes trial races at their courses of Gulfstream Park, Santa Anita and Golden Gate Fields. 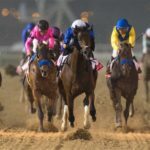 The Preakness Trial races will be known as Preakness 55 and are designed to attract top three year olds from both the east and West coasts, who will have to qualify in other races to get in them. For the big race itself MI Developments have agreed to grant a $5m bonus to the owner of the winner and a $500,000 bonus to its trainer. 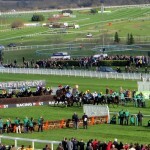 It is hoped that the race will become one of the most spectacular events anywhere in racing in the USA. As any big race, the Preakness Stakes has its set of records; for instance R Wyndham-Walden holds the record most wins by a trainer of seven, the last of which came in 1888. There are a number of trainers who have five winners, including two, D Wayne Lukas and Bob Baffert who will have aspirations to topple the long standing record. Top jockey in the race is held by the brilliant Eddie Arcaro with six followed by the now retired pat day with five. In all its history and despite their weight advantages only five fillies have ever won the race which include Rachel Alexander who won two years ago becoming the first since 1924 to do so. In 2011, there is much talk surrounding the unbeaten Uncle Mo winning the Triple Crown, which would obviously mean he wins the Preakness Stakes en route to writing his name in the history books. As a juvenile, Uncle Mo impressed on each of his three wins, improving each time and culminating in a great win at Churchill Downs to land the Breeders Cup Juvenile. Much will depend on how well the Todd Pletcher trained runner comes on for the break and stepping up to race as a three year old but the expectations surrounding this Colt suggest big things are expected and the 34 year wait for a ‘Triple Crown winner’ could be about to end.